Home > Foodie > Dinner Date at Botejyu One Bonifacio! As they say, never end dating as a couple! 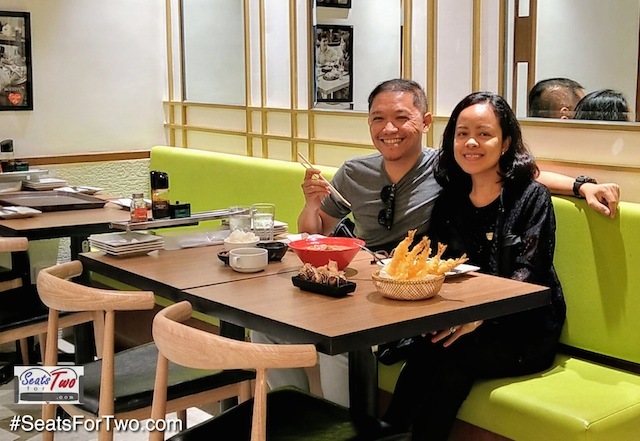 So when we got the chance to visit Bonifacio Global City, we made sure to try out as well the newly opened Botejyu at One Bonifacio High Street mall just across Central Square and beside Shangri-La Fort. It’s actually their flagship store and is located at the 3rd level. It’s our first time here as we frequent the one in Ayala Cloverleaf Mall north of Metro Manila. 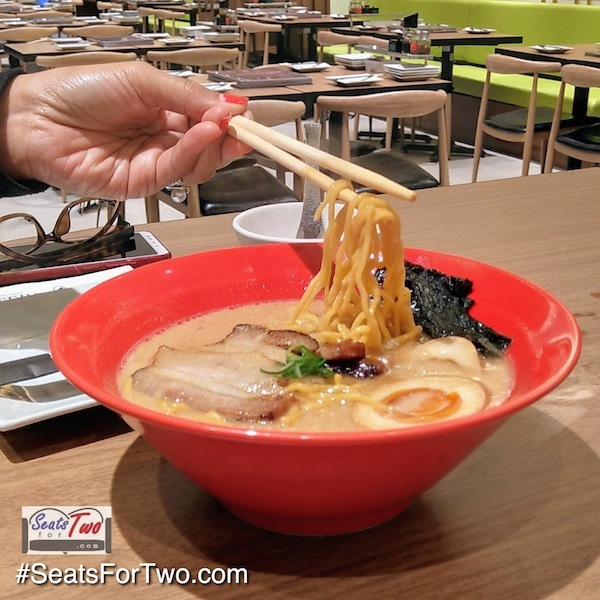 Mr. & Mrs. Seats For Two at BOTEJYU One Bonifacio High Street! So what did we order? You can guess it! We ordered thier Takoyaki! I know some of you might have guessed their famous Okonomiyaki but we decided to skip it for tonight as we frequently order that. The wheat flour-based batter is a proprietary Botejyu ingredient, and goes well with the fresh tako (octopus) bits. It comes with six individual sauces and flavors: umami sauce and mayo, tomato sauce, spicy mentai mayo, thick spicy sauce, and salt and garlic sauce. Move up to the mains and try Pork Paitan Ramen, a rich and delicious pork and noodle dish dashed with a trace of Botejyu’s magical oil that adds soul to the soup. 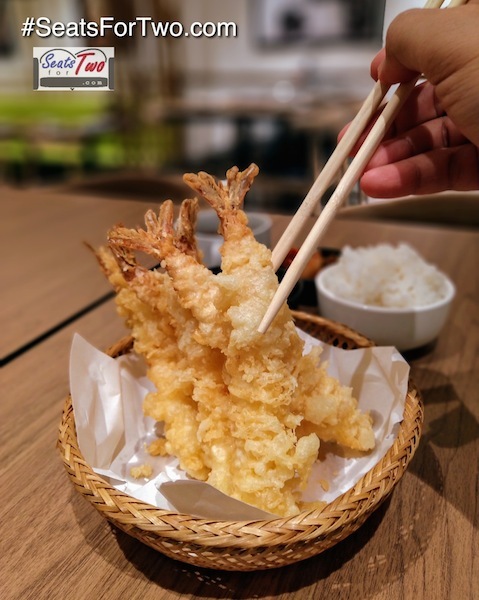 The Shrimp Tempura Platter is also one of their best-selling dishes, a testament to the Filipino love for fried food. The batter is light and crunchy, with hints of natural umami flavors. 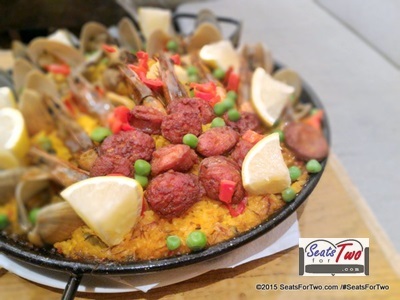 If you want something heavy and hearty, the beckons. A local specialty of Hokkaido, this rice bowl is topped with thick grilled pork slices and a special soy sauce that lends a sweet-savory flavor. Moreover, you can also try the Amiyaki Grilled Pork Rice Bowl. Then there’s the yakisoba and get warmed by their Osaka Premium Moonlight, Mixed Seafood, Beef Kalbi Sukiyaki, and the Pork flavors! Botejyu’s Karaage, meanwhile, is the number one karaage in Japan, and has become the favorite of chicken-loving Filipino foodies as well. 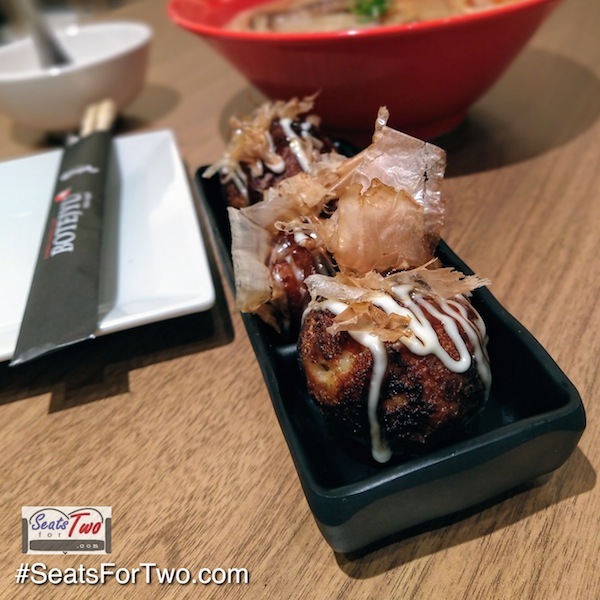 Other famous dishes include the Teppan Pork Gyoza, Spring Rolls, Beef Sukiyaki Rice Set, Omusoba, and of course, the other original concept, their Okosoba. Also called “modern-yaki” by Nishino, this hearty dish is made with their house yakisoba noodles and cabbage that is packed in between the special batter and egg, a truly comforting dish. 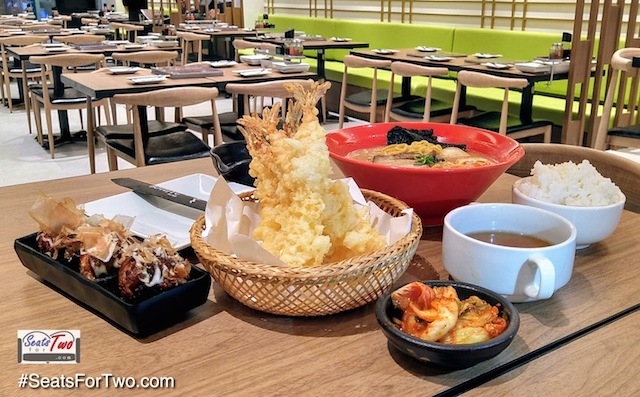 Among other things, this is what we like about Botejyu Philippines – they bring the authentic taste of local Japanese food through popular dishes from each prefecture. To keep the original flavors consistent even to this day, Botejyu is particular about ingredients that go into every dish. Botejyu in the Philippines, in fact, imports 70% of its ingredients—from meats to sauces. Follow Seats For Two by subscribing to our blog through email and liking the Seats For Two Facebook Page. Follow our Twitter and Instagram accounts too! Other BOTEJYU branches are in SM Mall of Asia, Festival Mall, SM City Dasmarinas, SM Megamall, Robinson’s Galleria, Robinson’s Magnolia, Ayala Malls Cloverleaf, Ayala Malls Vertis North, Ayala Malls Trinoma, Ayala Malls Feliz, SM Pampanga, Solenad, and soon in Greenbelt, Greenhills, and Ayala North Exchange.